When it feels just a little too sad to say goodbye to your beach stuff (even though fall is upon us), upcycle them instead. From beach towels to umbrellas, we've found a handful of projects that'll extend the life of these seasonal standbys. Even mementos, like seashells. In the above project, shells are turned into adorable candles with a spoonful of wax and a tiny wick. How cute would they be for a wedding? For a tutorial on making shell candles, visit Country Living. 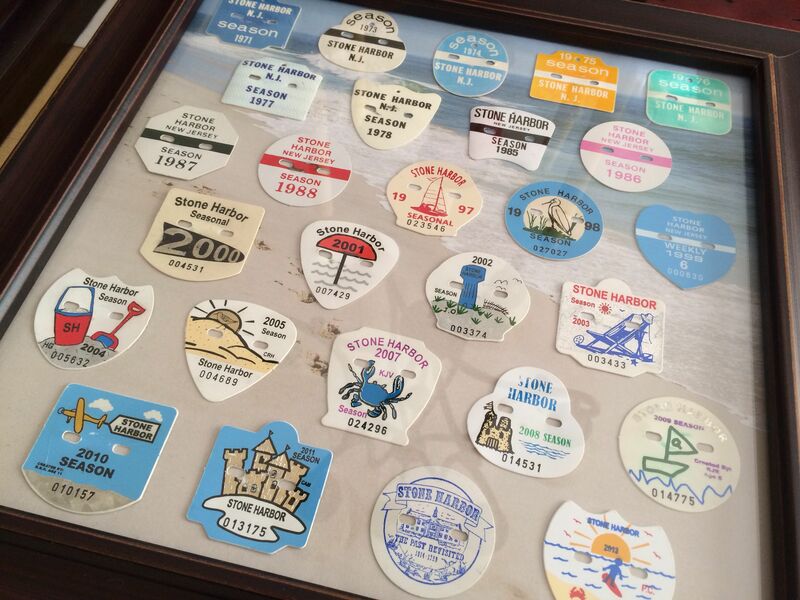 If you've amassed a small collection of beach badges from your summer trips, it's time to put them to a better use (other than, you know, letting them sit in a drawer for years). Simply take a shadowbox-style frame, then hot glue the badges around the mat. Head over to Pinterest to take a closer look. Beach towels mopped up the splashes of a million pools this summer ... and for the rest of the year, can help keep your bathroom floor nice and dry. Just cut towels into strips, braid together and coil. Sew the braids in place using heavy-duty thread and a curved needle. Check out Hearth & Vine for details. If you have a, shall we say, "active" household, you know that a floor pillow can quickly go flat from the daily wear-and-tear of kids and pets. Most types of stuffing just can't stand up to repeated washing. Instead, stuff the pillow with beach towels. Cut them up to make them into a lofty filling that's easily washable. Stop by AKA Design for a No Sew Floor Pillow tutorial. Fall showers mean that Fido needs a little more than his natural coat to get through his evening walk. Enter: A dog raincoat. But this one is a little different than most conventional coverings ... because it's made from old umbrellas. Wonderfully waterproof, and if you use a novelty umbrella, very unique. For a selection of free dog patterns, visit Inhabitat. When temperatures dip, you can count on an old-fashioned draft stopper to keep the warmth indoors (where it belongs). While some basically consist of a tube of material stuffed with beans, stuffing or cotton, this option is far easier: Just roll a towel into a "snake," and tie with string to secure. You could stop here or go for broke with snake-like details. Sassy Bags and Rags has a tutorial. A small lunch bag made from spill-proof nylon will save your morning commute countless times. (Because how many times have we opened our lunches to find a mysterious spill or explosion?) Just give it a rinse and you'll be able to use it again. Epic disaster? Then you can throw it away guilt-free, since it's made from a broken umbrella. For a cute (and free) lunch bag pattern, visit The Long Thread. Like the lunch bag, this tote bag also can be made from an old umbrella. It's just bigger, that's all. Yes, it's great for groceries, but we like to tote it along with our working umbrella. Why? Because it provides a waterproof place to store a soggy umbrella after an impromptu shower. Pop over to Sierra for details. Fact: Dogs (and cats too) love a big, welcoming, fresh-from-the-dryer towel. So why not make his day by handing down your old beach towel just for this specific purpose? Give the dedicated towel a quick tumble in the dryer anytime your precious pet needs a pick-me-up.